This has to be my favourite time of the month – the time where I look through all the new things I bought and realize that there might be a few that I haven’t stopped using since. 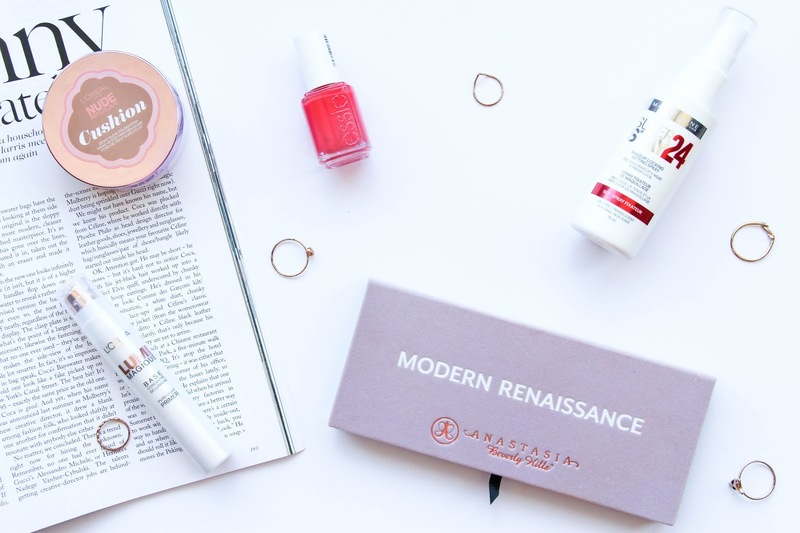 So that is what I am here to share with you today – my absolute favourite products of this past month and I have some great ones to share with you! This past month I discovered a few great products (meaning that I probably spent more money than I should) and the one that I can’t take my hand of is the beautiful Anastasia Beverly Hills Modern Renaissance Palette. Yes, it is pricey but you get the quality of an amazing brand that is ABH. I do not regret even a little bit of buying this palette. Since I bought it, is has been my go to eye shadow palette. There are so many looks that you can achieve, it is so versatile, super pigmented and the shadows are so, so easy to blend! Read my full review here. L’oréal has to be my favourite brand of the month (if not year). They have a great makeup range and also skin care. You probably have noticed that I have been featuring a lot of L’oréal Paris products and that is honestly because I love the brand. I believe they have the best makeup and skin care products and it is always my “go-to” brand when I am looking for something special. 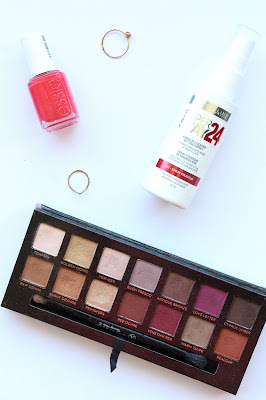 This month there is actually three products that I absolutely can’t live without. First is the amazing L’oreal Paris Lumi Magique Cushion Foundation. This was one of the L’oréal new releases and they are doing soooo well! I love this foundation. It is dewy, it has a buildable coverage that I love and it is long lasting. It is my go-to foundation when I have a tan on (I still need to buy my no fake tan shade). I also reviewed this product on the blog, you can read it here. 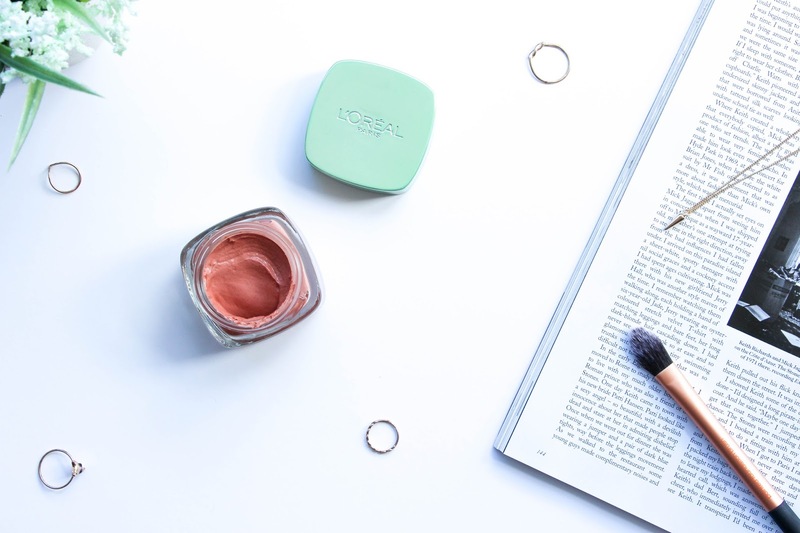 The new L’oréal Paris Pure Clay Glow Mask is also a big favourite! I have already reviewed this product on the blog, as always, and I got really great feedback from you guys. I do hope that you have already tried any of the Pure Clay face masks as they are definitely amazing! It leaves my skin so soft and with such a natural glow. Absolutely in love with it. To stick with the dewy and glowing skin, another must have for me is the L’oréal Lumi Magique Pure Light Primer. Again, if you want to know more, you can read my full review here. It leaves your skin with a beautiful glow and even base to apply your foundation. A fixing spray is something I never felt the need to have in my makeup collection. I always thought that applying it or not didn’t really make a difference until I found the Maybelline Superstay 24H Setting Spray. I bought this only a week or so ago because I love their Superstay 24H Lipsticks and so I thought I would give it a go and I am so happy I did. This spray makes my makeup last much longer. I notice that my foundation stays flawless for a longer period of time, specially when I work those crazy 12 hour shifts. I am so happy with it. It is great for any occasion but specially for those special days where you have a night out, dinner or wedding you have to attend. This will definitely make your makeup look flawless for much longer. To finish the monthly favourites, last but not least is the Essie Nail Polish in the color Sunset Sneaks. It has a very spring/summery color. Bright, colorful, almost sort of neon. It is such a beautiful nail polish and definitely makes me feel all ready for a beautiful summer day. And this is the end of a very long but exciting post – at least for me! Share with me your absolute favourites of this month. I love trying out new products. Next Post Sometimes insecurity hits you and.. that is fine.